Hajime Misaki (Kento Hayashi) gave up on his dream of becoing a boxing champion. 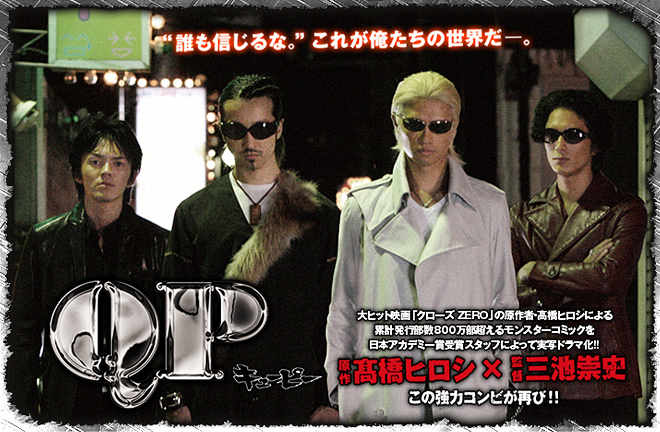 One day, Hajime meets Ryo Azuma (Takumi Saito), the boss of the Tenrokai gang. Hajime admires Ryo who carries an extraordinary aura. Right away, Hajime joins the Tenrokai gang. Actor Sousuke Takaoka was originally cast as lead actor, but withdrew from his talent agency and subsequently his role in "QP" over controversial remarks made on social-network site Twitter.